England 1912. 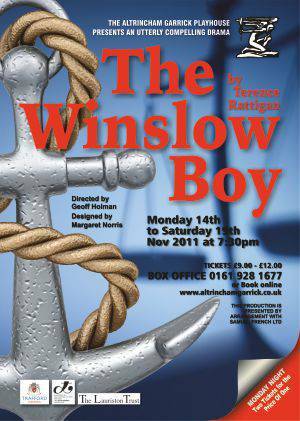 Based on a real life legal case, the play concerns 13 year old cadet Ronnie Winslow, who is expelled from military college for the theft of a five shilling postal order. His father, believing in his son’s innocence and moreover that the boy has not received a fair hearing, will not let the matter lie. He embarks on a case that will last several years and becomes the source of much attention from the press and public with some admiring Winslow’s perseverance and others perplexed by his unwillingness to drop what they see as a trivial matter, especially given what is brewing in Europe. Set in the years leading up to the First World War, the play has a familiar English drawing room feel. There is a sense of events taking place during a brighter, better time that exists no longer, and this is echoed in the light, airy set – but it is also an utterly compelling piece of theatre. THE crime that gets Ronnie Winslow kicked out of naval cadet school wouldn't raise any eyebrows these days. What does make an impression when watching?The Winslow Boy?is the way his family fight like tigers to clear his name. Particularly his father, Arthur, whose appetite for the struggle remains undiminished even when his health starts failing him. There are some touching scenes between Ronnie and his dad, a character hopelessly set in his ways and these are perfectly played by Daniel Shaw and David Reynolds in Altrincham Garrick's latest production. David has the sort of voice I could listen to for hours and they look and sound like a real father and son. The Winslow Boy?tells an uplifting story at a sedate pace and there are some wonderful lines in Rattigan's thoughtful and at times witty script. In Catherine Winslow, Ronnie's sister, the writer gives us a woman who dares to speak her mind in an age where many were still subservient to the men in their life. For me, this is Ali Davenport's best performance to date on the Garrick stage and Catherine memorably clashes with cold fish of a lawyer Sir Robert Morton, played by Martin Oldfield. I'm rapidly coming to the conclusion that this man is incapable of a bad performance.